Students in Grand Canyon University’s Colangelo School of Sports Business got an inside look at the world of auto racing Friday morning from a NASCAR pit crew coach. 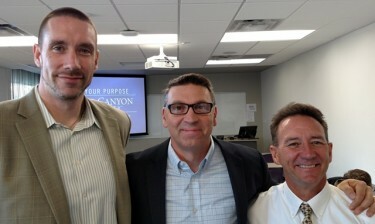 Matt Clark (center) with Dr. Brian Smith (left), director of the Colangelo School of Sports Business, and assistant professor Rick Roth. Matt Clark has been on a winning NASCAR team more than 80 times in his association with top drivers Jimmie Johnson and Jeff Gordon and also is a former Fox network television analyst. But he said he values coaching more than being in Victory Lane and took great joy in giving students books to read and thoughts to process. “You need to lead every lap,” he told them. “Adapt” applies to him these days as he looks for new opportunities in communications, but he still manages pit crews about 10 to 12 weeks a year. He explained how he comes from a high-pressure world in which an extra 1.5 seconds for a pit stop can be the difference between having a job or looking for work. But his main mission was to educate students about NASCAR’s popularity and how sponsorships work. “There’s a lot of opportunity in the NASCAR community for you to leverage your strengths and use your abilities,” he said. Clark urged students to read four books: “Mindset” by Carol Dweck, “How to Be a Power Connector” by Judy Robinett, “Get Noticed!” by Michael Hyatt and “Rich Dad, Poor Dad” by Robert Kiyosaki. But his primary message was how to apply the ideas from those books. And Clark said his Christian values have differentiated him from some of the self-centered people who populate high-profile ventures such as professional sports and television.